BBC Scotland is having a bad referendum - and things just got worse. The independence referendum has thrown a spanner in the works of large parts of institutional Scotland. So far the biggest meltdown has been CBI Scotland becoming a registered ‘No’ supporter, then baulking at the consequences. Another was the maneuvering of SCVO on the second referendum question and then being left on its own when the politicians agreed on a single question. But fast coming up the tracks in the incompetence stakes is BBC Scotland. The latest instance is the axing of BBC presenter Gary Robertson after 24 years working for the BBC, 15 of them with BBC Scotland. Robertson has been got rid of for financial reasons. What is not officially acknowledged by the BBC, but obvious to everyone, is that this is directly related to recent decisions to hire on sizeable six figure salaries, Jim Naughtie and Sarah Smith. A number of questions flow from this. First, how the BBC has covered the independence referendum. The axing of ‘Newsnight Scotland’ and its replacement by ‘Scotland 2014’ was long suspected in principle, then left late in the referendum (with the latter first broadcasting on Tuesday May 27th), and then produced with minimal preparation and no pilot. Little surprise that the programme which emerged, from its opening credits to its feel had a similarity to a Saturday morning kids programme from the late 1980s! Now the Sunday morning radio programme ‘Headlines’ presented by Ken Macdonald is to be replaced by one called ‘Crossfire’ which will be anchored by sitting Labour MSP Kezia Dugdale and former SNP MSP Andrew Wilson. Leaving aside that ‘Headlines’ was widely seen as one of the few BBC successes in the independence debate, the meaning of this decision could not be clearer. The referendum is nothing more and nothing less about party politics, and the tramlines of the Labour v. SNP argument. No more imagination or conversation required! Second, there is the treatment of BBC journalists and staff by senior management. Consultation procedures with staff have long broken down; management make decisions by diktat and pronouncement. All sorts of decisions and changes have been dropped on staff from out of the blue: the announcement of the end of ‘Newsnight Scotland’ came as a surprise to its staff, with no consultation or forewarning. They were then left for four months on death row with no detail on when the programme would end. Third, a worrying pattern is developing – that Scottish based journalists and staff who have spent years working for BBC Scotland do not get any respect or consideration from senior management in terms of support and recognition. This is despite a decade plus of devolution and becoming more pronounced due to the independence debate. Jim Naughtie and Sarah Smith have come north on expensive contracts to head up significant parts of BBC Scotland’s independence coverage. BBC Scotland now finds itself facing in contradictory ways: £5 million extra funding for BBC Scotland’s Independence Unit headed up by John Mullin (another London Scot ‘headhunted’ north), while the station’s news and current affairs is facing cutbacks and pruned budgets. If people think its coverage is poor now, and it is, think what it could look like after the referendum. The extra funding has stopped, and some, if not all of those, who have come north go back south again, while the leadership remains the same. Both Naughtie and Smith have qualities. They also have deep Labour roots and backgrounds, and have not been immersed in the Scottish debate, having spent long periods living elsewhere. It is no secret and not a surprise that both have been known to express dismissive views of the SNP. Naughtie has done this several times since his arrival north, off air to BBC colleagues. Naughtie gave a revealing interview just over two months ago to the ‘Scottish Daily Mail’ where he showed his tetchiness on all this, stating, ‘I wasn’t parachuted in …’ And then felt he had to stress that, ‘I am getting on extremely well with my Scottish colleagues, there’s no issue. In any case, this idea of being parachuted in, loads of people from Scotland come down and work in Broadcasting House – why shouldn’t I come up and work here for a bit. It’s one organisation’ (Scottish Daily Mail, March 20th 2014). Finally, what drives much of this is the question of who has power in BBC Scotland, and who senior management see themselves as accountable too. The answer to this should, of course, be the people of Scotland who are after all the audience and the ultimate paymasters – from the licence fee. BBC Scotland does not work like this, for ultimately, it is only really accountable to the BBC Trust (and before that the Board of Governors). All of this has to be seen in a historic context. BBC Scotland has, since the emergence of the constitutional question in the 1960s, found it uneasy and a subject it wished would just go away. This is because it throws a series of powerful searchlights onto the issue of who it serves and who it is accountable to. BBC Scotland has been behind the political and constitutional curve of the current era of devolution from the 1997-99 period when the Scottish Parliament was proposed and legislated for. There was the mess and non-establishment of ‘the Scottish Six’, the compromise of ‘Newsnight Scotland’, and politics seen by the Beeb high-hied yins as a minority pastime of the political classes. The independence referendum has merely accelerated all these tensions and shone a light on them. There is a profound absence of leadership, courage and standing up for a positive vision in the highest levels of BBC Scotland. Instead, senior management have consistently tried to second guess which way they think the political wind is blowing and then follow it. Thus, the mess of the BBC’s independence referendum coverage. A couple of years ago, a BBC insider said to me that, ‘BBC Scotland is a fiction’. This is an over-statement, similar to the argument some put that the Scottish Labour Party does not exist, but captures a profound truth about where power lies. 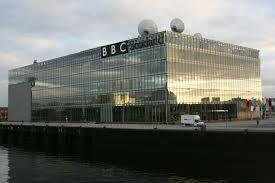 BBC Scotland sounds like a good idea, but so far it has proved to be nothing more than an idea, aspiration and a brand name on the front of the building. Remember those Naughtie words when he said ‘there’s no issue’ about him coming north because ‘it’s one organisation’. Never have a truer set of words been said, but not in the way Naughtie meant. Whatever the outcome of the independence vote, far-reaching change will come to Scotland’s main broadcaster. This may prove to be too late for BBC Scotland in its current form, but that could turn out to be a gain for the viewers, listeners and citizens of the country. Then again, BBC Scotland was born of another age, and has so far shown itself unable and unwilling to embrace and represent the modern Scotland it claims to care about. If you want to keep OurBeeb debating the BBC, please chip in what you can afford.